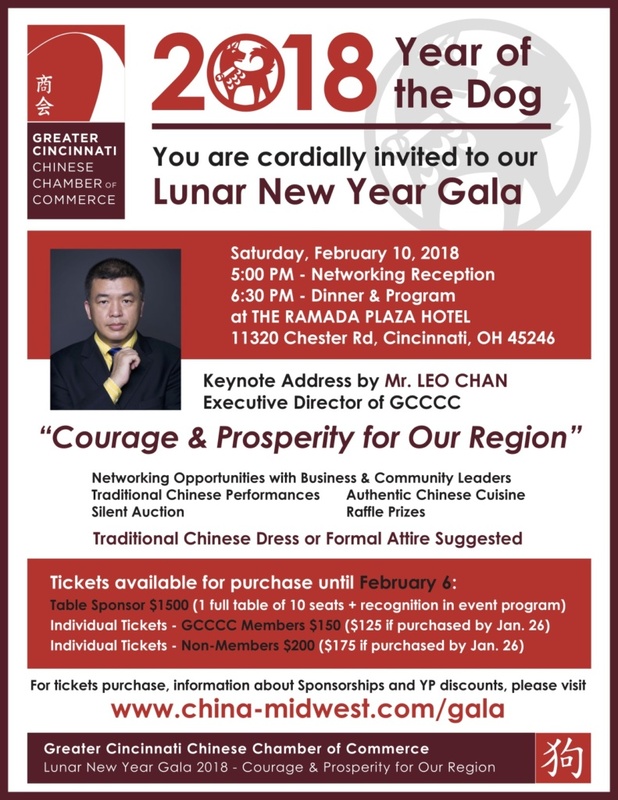 The Greater Cincinnati Chinese Chamber of Commerce holds this signature event annually to celebrate the beginning of the Lunar New Year. It’s a wonderful opportunity to observe one of the most important holidays in the Asian culture, and support our mission of Building Bridges between Greater Cincinnati and Greater China. We invite you to celebrate with us, along with our Chamber members and representatives from all over the Greater Cincinnati business community. For any questions or additional information and details about the event please do not hesitate to contact us. 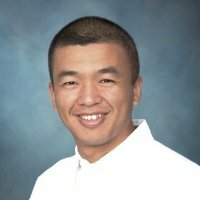 CINCINNATI – December 12, 2017 – The Greater Cincinnati Chinese Chamber of Commerce has hired Leo Chan as its new Executive Director, effective December 18, 2017. A former board member of the Chinese Chamber, Chan brings a wealth of diverse and international experience in financial services, private equity investments, and the tech industry to this role. He has served in several Fortune 500 companies and multinational corporations, running funds of over 1 billion RMB and investments of over 1 billion USD in mobile telecommunications infrastructure in China and other parts of the world. Chan will keynote the Chinese Chamber’s annual Lunar New Year Gala at The Ramada Plaza on Saturday, February 10th, 2018. “The Chinese Chamber has grown significantly in membership, visibility, and influence in Greater Cincinnati in the past 2 years thanks to our previous Executive Director Tessa Xuan’s contributions. Leo Chan’s business expertise and local, national, and international connections will take us to the next level in terms of building more bridges with Greater China to expand opportunity for the local business community. We are very much looking forward to this Chamber’s even brighter future under his new leadership,” said Catalin Macarie, Board Chair of the Chinese Chamber. 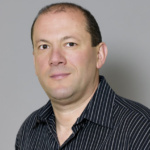 As a seasoned IT visionary and expert in mobile telephony and wireless broadband access, Chan has served in roles at several telecommunication companies including France Telecom, Cincinnati Bell, and Hawaiian Telcom. In 2008, Chan formed a partnership with former Merrill Lynch executives in Asia. He led initiatives to build a merchant banking operation in Shenzhen, China, where he built strategic relationships with Goldman Sachs, Legend Capital, Credit Suisse, Morgan Stanley, and China International Capital Corporation. After years of endeavors in the venture capital and private equity industry, Leo helped build a series of venture capital funds including TCL Capital, KB Capital, and SR Investments. By working with local municipalities, Leo was able to form public private partnership funds to fuel the startup and infrastructure build out projects in developing cities. He also led a supply chain management company that specializes in advising and helping US companies to source from strategic partners. Chan studied International Business at Guangzhou Institute of Foreign Languages in Guangzhou, Asia Europe Programme at Sciences-Po in Paris, Intermediate Japanese at Dalian University of Foreign Languages in Dalian. He originally moved to the Cincinnati area to earn his MBA from the University of Cincinnati, which he was awarded in 2001. Japan is a chain of almost 7,000 islands stretching from Siberia in the north to Taiwan in the south. Of these islands, Hokkaido to the north and is the home of the Ainu people. The largest Japanese island is Honshu, the main island. It is slightly larger than Great Britain and is the home of Mt. Fuji—an active volcano at 12,388 ft. The Shikoku island to the south is the ancestral home of Shingon Buddhist Kōbō Daishi (774–835), and the 88 Sacred Temples of Shikoku. Kyushu is the southernmost region bordered by the East China Sea to the west and the Pacific Ocean to the east, and stretches along the Ryukyu archipelago out for some 700 miles to the southwest. The Paleolithic people from the Asian mainland was said to have settled on the islands some 35,000 years ago. About 10,000 years ago, the Jomon hunter-gatherers emerged and are said to be ancestral to the Ainu people. Korean settlers came around 400 BCE and brought with them metal-working, rice, and weaving to Japan. Japanese recorded history began with the Kofun period (250 CE) and is characterized by burial mounds, ruling warlords, and adoption of many Chinese customs and innovations. Early records of Buddhist monks from China can trace to this period of the Japanese history, but official introduction of Buddhism is date to the Asuka Period in 522 CE by Korean emissary monks. The first Japanese central government came in the 8th century. Buddhism and Chinese calligraphy flourished with the aristocratic class; Shintoism—a collection of native beliefs and mythology devoted to the worship a multitude of gods (kami), was more popular with the commoners during this period. This period also saw the rise of a uniquely Japanese culture with imperial court artisans, poets, and the emergence of the samurai warrior class. Shoguns demanded blind loyalty from their samurai and became more powerful over time. They eventually took power in 1185, and ruled Japan in the name of an emperor until 1868. A constitutional monarchy was established thereafter, headed by the Meiji Emperor; and marked the end of the shoguns. Meiji Emperor’s son was chronically ill and this gave opportunity for the country to further democratize. Japan controlled Korea and northern China during World War I. Emperor Hirohito oversaw Japan’s expansion during World War II. He surrendered at the end of the war and subsequently reigned as Japan became modern industrialized nation. Today, Japan is a parliamentary constitutional monarchy with 47 prefectures. It has a civil law system based on the German model and heavily influenced by the Americans. The Japanese people values cooperation, have a strong work ethic, and are polite, calm, and reserved. The Japanese economy is prized for its interlockings and efficiency. In 2016, it was the fourth-largest economy in the world but it has faced repeated recession and slow growth in recent decades. The Japanese mindset centers around their natural environments, from jagged mountains to cascading waterfalls. Their fascination with nature is evident in their spiritual interest in Shinto, the Way of the Gods—a belief that every mountain, stream, tree, or impressive rock has a spirit. These spirits (known as kami) are watchers over human affairs. Confucianism gained popularity in Japan in the 7th century and persisted for centuries (it was the stated ideology during the Tokugawa period in the 17th century). The Japanese writing system was imported from China. The earliest Japanese texts were written in Classical Chinese; however, the Japanese written language evolved gradually and branched during the 9th Century. Almost all modern written Japanese has a mixture of kanji (Chinese) and kana (Japanese native). Kana is itself two distinct syllabaries: the Hiragana—often seen in poetry, diaries, and novels, became a cursive abbreviation for the kanji (Chinese), used mostly by women as they were excluded from the study of Chinese characters; and the Katakana—used by Buddhist monks as laced mnemonic devices to help bridge the inflections between spoken Chinese and Japanese. Japanese art styles range from ink painting and calligraphy on silk and paper, to woodblock prints, origami, and more recently manga. The Japanese aesthetics incorporates elements of foreign culture such as China that complemented their preferences. In the 9th century, Japan began to develop indigenous forms of expression and painting is the preferred medium. Japanese ceramics is also well known around the world; and the Japanese prefer to build their homes with natural materials and tends to blend the interior and exterior space to reflect harmony and family character. “Chanoyu,” translated literally as “hot water for tea,” refers to the art of preparing and serving tea. Chanoyu is meant to indoctrinate gathering of friends evoking self-awareness, generosity towards others, and a reverence for nature. The tradition was introduced from China in the 12th century by Japanese Buddhists. Its principles include harmony between guests, hosts, nature, and setting; respect and sincerity toward another; spiritually cleanse; and inner peace allowing one to truly share. Each tea gathering is a once in a lifetime event. Therefore, the sharing of a bowl of tea should be conducted with humble nature and the utmost sincerity. Since 1639, Japan had maintained a strict isolation policy and emigration out of Japan was strictly controlled. In 1853, Commodore Matthew Perry of the United States Navy forced a trade relationship between Japan and the U.S. With this opening up, Japan underwent great transformations. But rapid urbanization and industrialization brought agricultural decline. As the US economy boomed, the lure was difficulty to resist. By the 1880s, Japanese emigration policy relaxed and Japanese immigration into the United States soon followed. The Japanese government even selected emigrants from time to time favoring ambition and good connections. Between 1886 and 1911, more than 400,000 Japanese immigrated to the United States mostly landed in Hawaii and the West Coast. The Japanese were among the last immigrant groups to come to Ohio. In 1940, only eighteen Japanese were documented as having resided in this state. During World War II, Japanese Americans were forced into internment camps. Some of the internees were eventually allowed to leave and many found employment in Midwestern cities. Some of these migrant Japanese workers returned to the West Coast after the war. The Japanese Americans who remained in Ohio were mostly recent immigrants from Japan; some came here as spouses of American servicemen. In recent years, many Japanese migrants have settled in Marysville, Ohio, due to the Honda manufacturing plant. According to one census, there are about 800 Japanese in the Cincinnati region. However, the popularity of Japanese food has been growing steadily in Cincinnati including the popular KaZe in OTR. The blog is in part of the Mission Continues blog series, written by Jin Kong and therefore all words and thoughts are his own and not a reflection of GCWAC. Jin Kong is a guest research fellow with The Greater Cincinnati World Affairs Council (GCWAC) for the next six months. This fellowship is sponsored by The Mission Continues. Through this fellowship, Kong is researching to gain a better understanding of the populist sentiment towards immigrants in the Cincinnati region. This is one blog of many on his research of immigration and Cincinnati. To learn more about Jin Kong click here. Human habitation of the now northern Vietnam dates back 500,000 years; primitive agriculture dates back to 7000 BC. The Chinese colonized the region for a better part of Vietnam’s recorded history. There was a brief Vietnamese independence in 40 A.D. led by the Trung Sisters; and another some 900 years later in 938 A.D. But Vietnam again came under China’s control in the early 15th century and once more sought independence by Le Loi’s famous victory over the Chinese in 1428. Between the Portuguese landing in 1516, the French and Japanese occupations, and the eventual America’s failed war, the Vietnam region was split between the north and the south. Historically it began with Trinh ruling the north and the Nguyen ruling and expanding the south, each aligned with a European colonial opportunist. The division and resentment worsened the anti-colonialism sentiment long held by the Vietnamese people. Eventually, communism became the successful party to lead an anti-colonialism campaign to “liberate” the South, which began in 1959. After the Vietnam War, United States re-established its diplomatic relationship in 1994 following the lifting of its embargo that had been in place since the 1960s. Vietnam entered the World Trade Organization in 2006 and experienced significant economic growth thereafter; it is now a major tourism destination for many. Due to the long Chinese influence, the Vietnamese people maintains a traditional family and clan based society. Although heavily influenced by Confucius and its feudal views of male importance, women play the most important role in family life. Moreover, Vietnamese women have long been inspired by the heroics of the Trung Sisters who led the very first independence campaign and won. Vietnam in its modern age has passed a number of laws on marriage and family in order to make family relations equal between men and women. But the time-honored Confucian tradition of “respect for the elderly and love for the children” are maintained and advocated in Vietnamese families. There are approximately 95 million people in Vietnam; 54 ethnic groups are recognized and the majority group is Kinh (Viet), which constitutes 86% of the country’s population. Vietnamese is the official language but English is favored as a second language. Chinese, French, and various mountain languages are also spoken. By far, the country is Buddhist and majority of the country’s population is between the working age of 25 and 54 (according to the World Factbook). Vietnam is one of the most densely populated region on earth and perhaps artistically vibrant for this reason. Vietnamese Literature has been developed with a unique multi-identity. Its traditional form takes shape in folklores, tales, humor, as well as Chinese and Vietnamese scripts. Its contemporary literature came to age with the introduction of a Vietnam national language (Quoc Ngu). Between 1945 and 1975, Vietnamese literature reflected aspiration for peace and independence; today it is much more a call to national identity and progress. The Vietnamese performing arts include popular, classical, and reformed theatre, water puppet, court music and dancing, folk-song, duets, ceremonial songs, etc. Vietnamese architecture consists of wood, stone, brick and thatch, bamboo and leaves, typically represented in pagodas. Vietnamese architecture is also influenced by European and North American styles. Many famous buildings were built in the classical European style, such as the Presidential Palace, Supreme Court, Hanoi Opera House, and the State Bank of Vietnam. Vietnam architecture was also influenced by the Soviets; for example, Ho Chi Minh Mausoleum, Friendship Cultural Palace, etc. Vietnamese paintings are traditionally worships and celebratory. 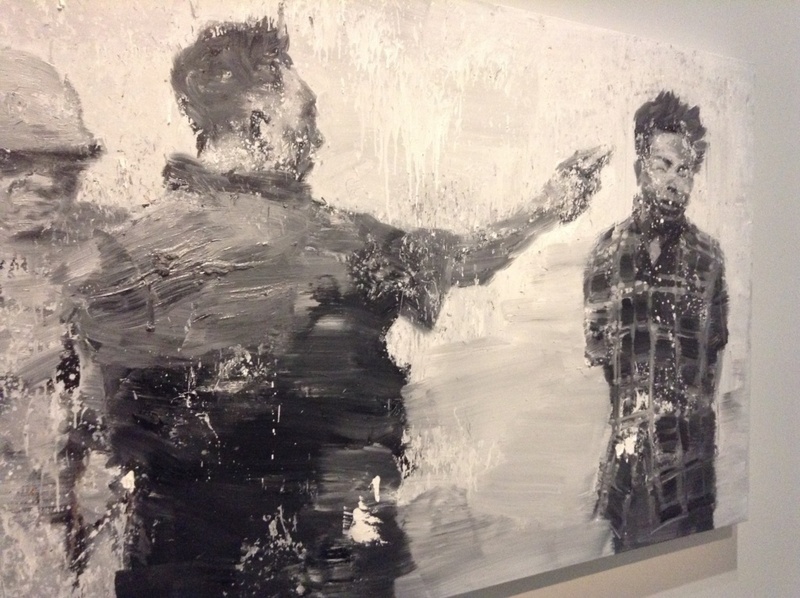 Its current artists, on the other hand, attempt to explore global subject matters and new styles of Vietnamese paintings on oil, lacquer and silk. Vietnam also has a long and rich history of hand-crafting ceramics, lacquer, silk, rattan and bamboo. Most Vietnamese festivals are held during traditional agricultural “leisure times” which are spring and autumn. Many of the major celebratory festivals are commonly found in other Asian countries: e.g., the Lunar New Year and Fall Full-Moon festival. The Lunar New Year is the biggest one among Vietnam’s traditional festivals. During this time, family get together and enjoy traditional food, visit relatives, friends and colleagues and wish them a happy new year. People of Vietnam respect the rule of balance and it is evident in their cuisine choices. Vietnamese food typically exhibits five taste elements: spicy, sour, bitter, salty, and sweet; corresponding to five organs: gall bladder, small intestine, large intestine, stomach, and urinary bladder. Vietnam cooking typically select five types of nutrients: powder, water/liquid, minerals, protein, and fat; and it also tries to have five colors: white, green, yellow, red, and black in their dishes. Rice is a dominate component to a meal, and choice protein often include fish, meat, or tofu. Vietnamese food is also well-known for its pickled, steamed, or fresh vegetables; fish sauce, made from fermented fish, is also commonly used. The North and South Vietnamese food differ much like the way China’s north and south differ in their eating habits. Southern Vietnamese food are often bold, made of fresh ingredients, often with rice, and strong in salt and fish flavors. Northern Vietnamese food are heavily influenced by the Chinese, including the iconic pho (China’s northern cuisine preference include noodles and breads). Due to its colonial history, Vietnamese food also takes a European spin. For example, Banh mi is a popular modern-day Vietnamese street-food that requires the use of baguettes, which was introduced by the French. But the Vietnamese people make their bread with a mix of rice and wheat flours. In 2010, Vietnamese was the 4th largest among Asian population groups in the United States. Majority of the Vietnamese immigrants live in California, Texas, Washington, Virginia, Florida, and Massachusetts. Immigration from Vietnam began as a humanitarian inflow due to the Vietnam War. In recent decades, family based immigration is more common. A 2014 census survey reported 1.3 million Vietnamese immigrants, accounting for 3% of the nation’s total immigrant count. (Source: U.S. Census Bureau 2014 American Community Surveys). Vietnamese immigrants generally have higher incomes compared to other foreign- and native-born populations. In 2014, median household income among Vietnamese immigrants was $59,933; and there were less Vietnamese immigrants living in poverty compared to other foreign- and native-born populations. Vietnamese immigrants mostly came to the United States prior to 2000. Since then, Vietnamese immigration significantly decreased. Today, Ohio is home to estimated 11,000 Vietnamese immigrants. Catholic Charities Southwestern Ohio claimed to have resettled more than 10,000 refugees in Cincinnati since the Vietnam War exodus. One census report puts Vietnamese population in Cincinnati to approximately 3,100 (closing-in on the approximately 4,000 Chinese and 3,300 Indian immigrants in Cincinnati). Along with this increased Vietnamese cultural presence, Cincinnati is now the home of many Vietnamese restaurants including the popular Pho Lang Thang, Quan Hapa, and lunch favorite located in downtown Cincinnati—Saigon Subs and Rolls. The University of Cincinnati has a Vietnamese Student Association claiming 311 members. The blog is part of the Mission Continues blog series, written by Jin Kong and therefore all words and thoughts are his own and not a reflection of GCWAC. I’ve been recently elected and will have the pleasure and great honor to serve as the Chairman of the Board of Directors for Greater Cincinnati Chinese Chamber of Commerce during the 2017-2018 fiscal year. I shall continue to build on the chamber’s success; and with everyone’s help, together we will continue to grow our Chamber’s visibility, involvement, and influence in the Greater Cincinnati economic region. I would like to thank our Executive Director, Tessa Xuan, and our immediate past Chair, Mr. Jin Kong, Esq., Chairman during 2016-2017, for their services to this Chamber. Under their leadership, our Chamber continued on the path of becoming one of the most active membership-based organizations in our geographic area. Mr. Kong will remain with the Board as Chair Emeritus and will continue to serve as trusted advisor. Ms. Tessa Xuan remains our faithful Executive Director leading our day-to-day operations. Also, I want to thank Ms. Hui-Pin Sepulveda (Deloitte), Ms. Rhonda Schechter (Frost Brown Todd), Mr. John Guo (Fifth Third Bank) and Mr. Franklin Lim (The Kroger Co.) for their involvement and great work as part of Chamber’s 2016-2017 Executive Team. Most of you know that 2017 is the year of the Rooster and we will be welcoming in 2018 the year of the Dog. It is traditionally believed that the upcoming Year of the Earth Dog is a good time for lifestyle changes and for the start of new business ventures. We hope you will join us for more good things throughout this new year. Be part of our family as we embark on a new phase for our Chamber: a time where we will focus on our members, their wellbeing, their growth and new relations. Collaboration is the relentless goal of our Executive Director. Ms. Tessa Xuan sincerely believes that this Chamber needs to work more closely and together with our members as well as help them collaborate with one another. Our future focus is to connect and bridge the gap between Greater China and our region. When people work together everyone benefits: the company, the people, the community. As Chairman, I will welcome and highlight involvements of our members. I hope to encouraging them to reach out and inform us of their specific needs. I also hope to see more member companies stepping up to contribute time, effort, and resources to build our common business interest between this region and Greater China. This coming year is an opportunity to fine-tune our programming for the inclusion of all member categories, should they be fortune 500 companies or mom-and-pop noodle shops. I will solicit their input and ideas for bettering our community, bringing all sides together for a stronger regional economic ecosystem. My personal commitment is to help people connect, create and develop relationships. My desire and future focus as the new Chairman will be to expand upon the relations we carved thus far. With the leadership of our Executive Director, Tessa Xuan, and the help of my fellow Executive Committee Officers, 1st Vice-Chair Ms. Rufan Li (University of Cincinnati), 2nd Vice-Chair Mr. Marvin Cunningham (Long-Stanton Mfg. ), Treasurer Mr. Kevin Kahn (K2 Industrial Controls Int’l Ltd.) and Board Secretary Ms. Rhonda Schechter (Frost Brown Todd), I hope to take our great Chamber of Commerce to new levels of excellence and recognition. Thank you all for being part of our Chamber family.